A kayak to the world... This was a charity for our friend Iraqi Moe. Moe through a series of unfortunate events ended up with cancer with out medical insurance in Amman, Jordan. He is a great guy and the rugby club has come together to help and support him. 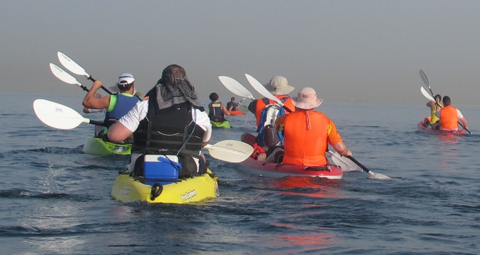 One of the fundraising efforts was a sponsored kayak to the world. So, at 7am on 11th May 39 of us set out across the open ocean on a bit of plastic. Luckily the sea was calm and it was paddle paddle paddle. As I looked around, we were getting to see Dubai from a whole new angle and my opinion a pretty cool one. All around you can really see the Burj Al Arab, Burj Khalifa, Sheikh Zayed road, Atlantis and the palm Jumeirah, the marina and finally the world. After an hour we reached the world and there was an opportunity to turn back or carry on. Is was getting really quite hot, uncomfortable we were a little tired soooo..... we thought of Moe and started paddling some more “too the end of the world!”. The current was against us. A quick some and you could feel yourself drifting backwards. Paddle paddle paddle. By this time our group of 39 had become a group 2; some in front and some behind. Our group, Kush and I, powered to the edge of the world. 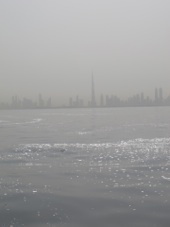 Round the green buoy and only the long slog back in the late morning Dubai May sun shine was left. Paddle paddle paddle paddle and a few big ups to each other and we landed safely on the beach from whence we came. Everyone had conquered the world and we all wish Moe the best of luck. You can do it buddy! *A special mention must go to the good people of my company Halcrow through which we were able to raise nigh on AED 12,000 for Moe. Kayaking - To the World!